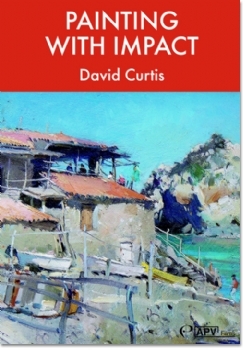 If your interest is landscape painting and your medium is oils, then who better to inspire and guide you than David Curtis. 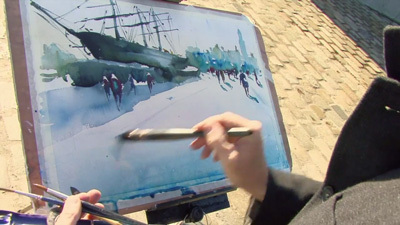 He is one of the most accomplished artists of the present day, noted especially for his plein-air work. 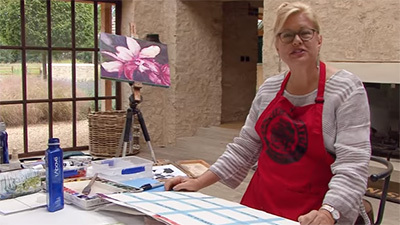 In Painting with Impact, David visits Mallorca, where he paints a variety of subjects, including beach scenes, a contra-jour evening study and a sunlit garden. 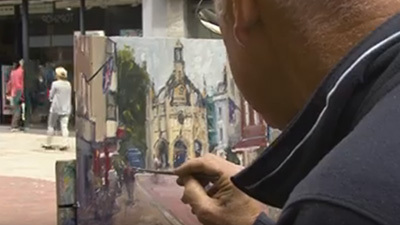 He works on prepared board, essentially using an alla-prima technique, showing how to convey the sense of mood and place by focusing on strong composition, tonal contrast, decisive brushwork and, as he says, ‘making everything count’. 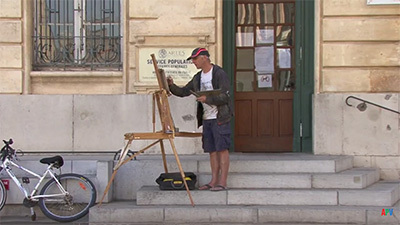 Later back in his UK studio, he paints a larger work on canvas, using a watercolour painted in Mallorca as his reference. As always his demonstrations are great to watch and are supported by lots of sound advice and information. 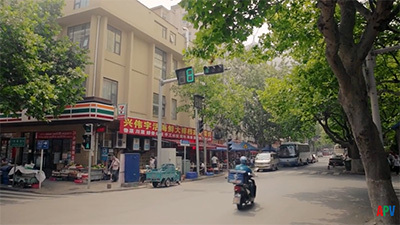 David Curtis has now produced seven films demonstrating his impressive techniques. 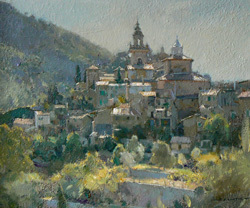 The latest, Painting with Impact, focuses on his use of oil paint, and takes him to beautiful scenery around Majorca. He first returns to a location that he painted over two decades ago. Originally worked in watercolour, this time he creates a chunky interpretation on board, capturing the interesting dilapidated buildings and roof-top restaurant at Deia beach. He discusses how he maintains the balance of lights and darks, and adds a few figures, including a couple in silhouette within the restaurant space, to bring the scene to life. The second painting is an evening study, looking across to Valdemossa, which provides a relatively complex patchwork of buildings leading up to the town’s church towers. David first indicates the general structure of the painting and then blocks in the sky around the buildings which anchors the composition. Little highlights are then added to the rooftops, followed by darker passages, that gradually define the volume of the buildings. Lush vegetation covers the hill that rises behind the town, whilst a mix of Cypress trees, a yew hedge, and other foliage interweave the area around and in front of the buildings. 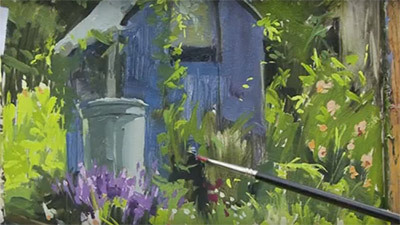 David moves to a quieter morning scene for the third composition, which features a small canopied building, with dappled light on the walls, and a splash of colour from exotic flowers in the foreground. 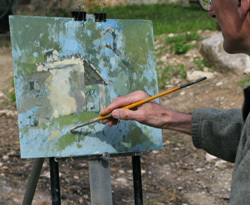 However, he is back by the water for the next painting, at Cala San Vicente, where he demonstrates working with a pochade, which is invaluable when working outdoors. Finally, David returns to his studio where he uses a beautifully executed watercolour of a café scene as reference for an oil. Working on a toned surface, the structure of the painting is sketched out in some detail. The highlights show up well against the background which David then balances with some deep shadows. The resulting painting is more sketchy than the highly resolved watercolour, remaining full of light and life. 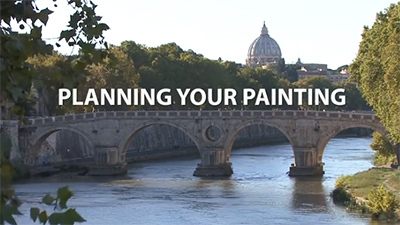 This is very much a series of demonstrations rather than an instruction film, but viewers will learn about balancing tone and developing strong compositions through watching David's confident approach and by acknowledging his appreciation of light.